Each country has its own recognisable newspaper design. And it’s likely to stay that way, says Norbert Küpper, founder of the prestigious European Newspaper Awards in an interview with Dutch News Design. Show Küpper a newspaper design template and he will likely tell you what country it is from. Some experts believed that all newspapers would look equal in design, by now. After all, since the arrival of internet, editorial designers all of a sudden had access to unlimited visual resources. ‘But we see absolutely no trend towards such a universal style,’ says Norbert Küpper. On the contrary: the nationality of a newspaper is surprisingly recognisable by its design. The Times of India used to look like the Times of London, but now it looks like an American newspaper. German based art director Norbert Küpper is mainly known as the founder of the European Newspaper Awards. But he also has an impressive international career, redesigning more than 170 newspapers since 1984. He designed newspapers in Germany, Austria, Czech Republic, Poland, Slovakia, Italy and the United Arab Emirates. Scandinavian newspapers resemble their interior design. Their newspaper design is very clean. When he founded the European Newspaper Awards in 1998, little did he know how high regarded it would become among graphic designers. The international jury received more than 200 entries from 28 countries for their 15th competition. Awards are granted in over 20 categories, of which the European National Newspaper of the Year is the most prestigious. One year earlier, in 2013, The Dutch Newspaper Trouw proudly displayed the subheading ‘European newspaper of the year’ on their front-page. During his long career Küpper learned that each country has a recognisable style: ‘Scandinavian newspapers resemble their interior design. You don’t see much furniture in households in Norway and Sweden. You see a wooden floor and further it’s spacious and light. Their newspaper design is also very clean. Norwegian journalists are more interested in design than German journalists. They personally want to contribute to the design, so at the end of the day their page looks fascinating,’ he says. In Great Britain the paper certainly would look different the day after an MP steps down. A huge photo would be an absolute necessity, as ‘bigger pictures’ (and big headlines) are the main thing in British newspapers, according to Küpper. 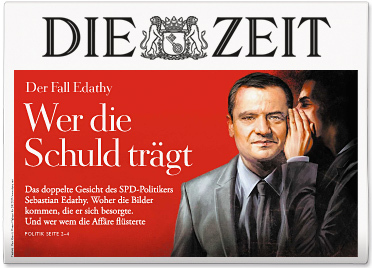 Frontpage of the German newspaper Die Zeit on the subject that led to minister Friedriech stepping down. A calm design. For the best infographics and visualisations you have to be in the Latin countries, like Spain, Portugal and Italy. Küpper: ‘I think this is mainly because the newspapers all have a special layout department. But what helps is that in these countries the newspapers have a very small target audience. In Spain, for example, papers are mainly read by an intellectual elite of high level readers. And these readers are used to good design.’ Yet he sees also a strong trend in the Netherlands and Germany to use infographics frequently. So why are newspapers designed different per country? That doesn’t explain all differences. A study on the user’s perception of a webpage by Yin Dong shows that Asians see webpages as a whole, where Western readers perceive webpage objects separately. In his research, Yin Dong used eye-tracking tools on Chinese, Korean and American readers who all read a similar lay-out of a webpage. The design was equal, the language different. Turned out the way Asian and Western readers looked at the page is completely different. Yin Dong described the Asian reading behaviour as holistic and the western behaviour as analytic. In design usability is a key-factor. It is likely that cultural differences in user behaviour is also visible in the design of webpages – and newspapers. Want to compare more national newspapers? Newseum.org displays a nice collection of today’s frontpages.